You are currently browsing articles tagged General Robert H. Barrow. Below is an article about Women in Combat with a stirring video by former Marine Corps Commandant General Robert Barrow. It is worth noting that this great man died within days of his friend, the late Colonel John Ripley. Both men testified before congress on the issue of sending our women into combat, a move which Colonel Ripley described as a “quest to neuterize all our institutions under the holy name of equality“. These great men have unfortunately been ignored. Take time to watch this stirring testimony on this issue by General Barrow. 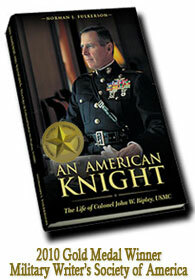 He is, like Colonel Ripley, a southern Gentlemen, a great warrior, and another example of An American Knight. There’s been rumor floating around the retired Marine community for a month or so now women will soon go through formal infantry training–officers to Infantry Officers Course and enlisted to Infantry Training Battalion. Fact or fiction? Credible nods from some senior active duty Marines suggest that’s the plan. Stunning. Is this of our commandant’s ordering or being so ordered? If true, it doesn’t matter. It’s a gargantuan mistake. That was the mission of a Marine rifle squad long before I became a Marine. That was the mission of a Marine rifle squad taught to me at Officer Candidates School, and so it remained through three decades of service. That is the mission of a Marine rifle squad today. And the mission of a Marine rifle squad is not likely to change any time soon. Twenty years ago there was a United States government bureaucratic undertaking (pardon the redundancy) to address the role of women in our armed forces. More directly, the agenda (of many engaged in that undertaking) was to expand the role of women in combat. The “Presidential Commission on the Assignment of Women in the Armed Forces” was a typical government operation–commissioners and information gathering panels and surveys and fact-finding visits to military installations and formal committee hearings and findings and recommendations. The effort checked every conceivable block. The Commission dotted their i’s and crossed their t’s–the paperwork was in order. It looked good. But if the truth be known, results either ignored or conveniently tailored to meet the desired end state was the modus operandi. No surprise. But the Commission, and their work, missed the point. And the critical point they missed, probably intentionally ignored, was eloquently addressed in the thoughts of one man–a retired United States Marine–before the Senate Armed Services Committee in 1991. During a 41 year career that Marine advanced from private to general. He commanded and fought, including close combat, in three wars–World War II, Korea, and Vietnam. He was awarded our nation’s second and third highest decorations–the Navy Cross, the Distinguished Service Cross, and the Silver Star, and others–for his leadership and heroism under combat conditions. That infantryman, of unimpeachable credibility and authority, spoke for about 13 minutes. The succinct, sometimes emotional, and compelling sentiments of General Robert H. Barrow (1922-2008), 27th Commandant of the Marine Corps, about women in combat, delivered eight years after he retired, are as germane today as when spoken. His blunt analysis is absolutely correct. So are his sobering conclusions. Time to watch the video. Will the Marine Corps be destroyed?